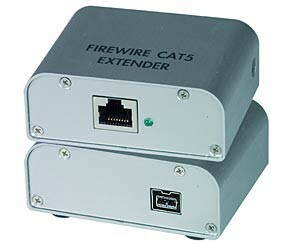 The ST-C51394-250 Firewire Extender extends one firewire device from a computer up to 250 feet (76 meters) using CAT6 cable and 150 feet (46 meters) using CAT5e cable. The XTENDEX ® 1394 FireWire Extender extends one FireWire device up to 279 feet (85 meters) using CAT7 solid 600 MHz STP cable, 250 feet (76 meters) using CAT6 550 MHz solid cable and 230 feet (70 meters) using CAT5e solid cable. Works at speeds of 400, 200 and 100 Mbps. Using Cat5e cable, extend up to 150 feet (46 meters). Pure hardware design, no software or drivers required. A/V broadcasting and editing (printers, scanners, digital cameras, digital audio recorders). Security (surveillance cameras, webcams, mass storage). Long range IEEE FireWire networking. Compatible with computers with 6-pin or 9-pin 1394 connectors. Full duplex data rate at 100/200/400 Mbps. One female IEEE 1394 9-pin connector on each local andremote unit. One female RJ45 connector on each local and remote unit. Local unit: powered by attached computer through FireWire cable. Remote unit: 110 or 220 VAC at 50 or 60 Hz via AC adapter. For best results, CAT6 550 MHz UTP solid cable or CAT7 600 MHz STP solid cable with TIA/EIA-568B wiring terminated with standard RJ45 connectors is recommended. Use the included crossover adapter to enable proper communication between local and remote units. 1394 FireWire Extender – local and remote unit. 6-inch (152-millimeter) male 9-pin 1394b bilingual to male 6-pin 1394a cable. Male-to-female CAT5e/6 RJ45 crossover adapter.